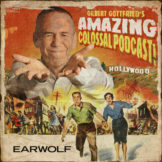 Gilbert and Frank welcome one of their favorite performers, Academy Award winner Keith Carradine, for a fond look back at his frequent collaborations with mentor Robert Altman, his friendships with co-stars Lee Marvin, Ernest Borgnine and Robert Mitchum, and the life and career of his dad, horror legend John Carradine. Also, Harvey Keitel loosens up, Jerry Lewis shoots hoops, Rod Steiger pays a surprise visit and Jessica Tandy lights up the stage. PLUS: “Love American Style”! Sam Fuller eats a stogie! Kwai Chang Caine hosts SNL! Deconstructing “The Aristocrats”! And Keith wins an Oscar for Best Original Song!